If you search Google play for the best screen recorder with the highest star rating, Mobizen will be the first app in the result page, at least for now. Why? Because with over 50 million downloads, Mobizen Screen Recorder have more than 1.3 reviews and more than 900 thousand of those reviews are 5 star rated. So when it comes to recording your mobile device activity are broadcasting it, Mobizen Screen Recorder is your best choice. Let's just take a time out to enumerate it's feature. Mobizen Screen Recorder is capable of giving you a video quality of 1080P Resolution, 12.0Mbps Quality, 60 FPS thus making it possible of you to record your screen activity in FULL HD video quality! More also, with it's Facecam feature, you will be capable to capture your reaction simultaneously as you are recording, and you can record as long as you want without worrying for space because videos created with Mobizen Screen Recorder are usually light-weight. 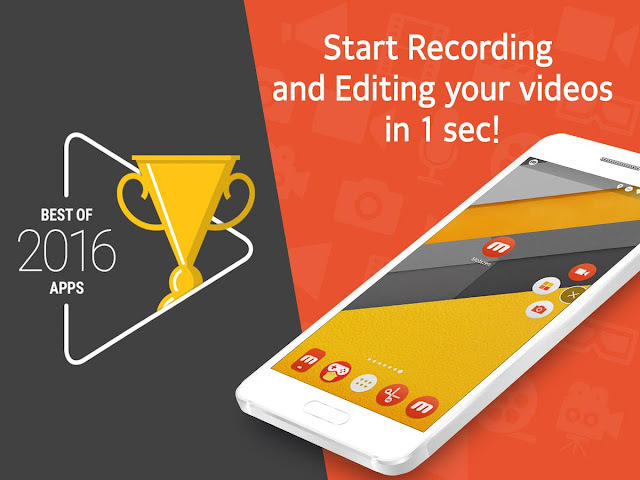 Do you also know that with Mobizen Screen Recorder, you can edit your videos? I bet you don't know that's why you are not using it. With the Mobizen Screen Recorder built-in video editor, you can Trim, Cut, add Image and your favorite BGM. You can also add an Intro and Outro video to your record and you can increase the quality of the video with various other video editing tools. And do you know the good news? Mobizen Screen Recorder is absolutely free. That is, no watermarks, using on a smart phone with android 4.4 and higher means that you do not have to root your device before you can use it!!! Now tell we why Mobizen will not be the screen recorder with the highest rating in Google Play for now. Before I forget, as the image above shows, Mobizen Screen Recorder is the best app as of 2016.